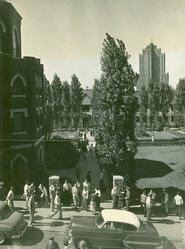 The year 2010 marked the 125th anniversary of Duquesne University’s venerable Administration Building. While the campus has undergone many changes over the years, “Old Main” has remained a constant throughout the generations. Dedicated in 1885, the five-story structure has housed dormitories, classrooms, laboratories and an auditorium. It survived a demolition plan and fire caused by a lightning strike. 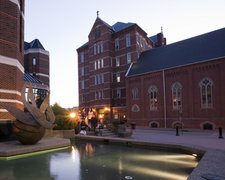 Renovated and revered over the years, it remains a beloved symbol of Duquesne University. This milestone anniversary was celebrated with an exhibit of historic photographs and artifacts culled from the Duquesne University Archives. This was displayed in the lobby of the Administration Building during Homecoming Weekend, Oct. 2-3, 2010. A special building blessing ceremony was part of the 11 a.m. mass in the University Chapel on Sunday, Oct. 3, 2010. You can view a webcast of the homecoming mass. The Admissions, Registrar and Financial Aid offices are located in the Administration Building. Find Old Main on the Campus Map.